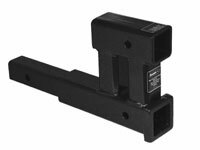 Extend your receiver by 12" or 18". Our New Dual Receiver features a standard 12" extension plus a second 6" tube. Now you can tow your trailer and mount a bike carrier from one receiver.